In this blog, I would like to share my thoughts on capturing end-user feedback, and how to bring it straight to Engineering team to build better products. There are many reasons why end-user feedback matters. Personally you may also have found feedback form as a means to voice your opinion and ideas, and engage with the product. Few reasons why I think end-user feedback matters are below. User feedback helps in making great products that matter to users. People (end-user) feels involved when a simple way to give feedback exists. People love to help, but not go over-board, so a simple feedback mechanism can be motivating. Influence better design, and features. – Engineering will connect greatly with product, seeing the end-user feedback. – Collective feedback from multiple users could make Requirements better, and motivate engineering to design holistically, and better. – Feedback loops through positive feedback will reinforce new functions/fixes/design. New ideas may emerge unexpectedly. Our client portals – are in public view, and end-users are spread across the globe. There are no clear ways for end-user to provide feedback. For example – One of our public portal has ONLY a phone number for anonymous users to give feedback, and logged in user has to go to bottom of page first, find ‘Contact Us’ link, then click the link which takes him/her to the Public site page, and then fill and submit an Online form. For a very known and accomplished user may email directly to an email address. I also believe that feedback that comes through email, is not adequately tracked till closure. To ensure that capturing end-user feedback is easy, and tracked we needed the following. One-Click Feedback mechanism for our end-users. Easy to use feedback form is easy to find on site, and opens in one click. – Have a subtle option in website at most often visited pages OR in a common area. 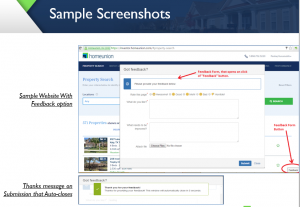 – Show feedback form on completion of a transaction. Make it easy to provide feedback – Keep the form simple and easy to fill. – Avoid login prompts, so that even an anonymous user can also give feedback. – Auto populate user name, email address in feedback form, if already available. End-user feedback needs to be collated at one place for review by stakeholders. Easy to follow Triaging process to triage feedback inside will help to keep tab on important feedback, and cut down outliers/noise. end-user feedback is collated at one place for review by stakeholders allowing product owners to manage feedback and work closely with engineering. provides clear tracking of feedback. After the idea was proposed, customer requested for a custom end-user form to capture end-user issues & feature requests. Using the recommended solution we launched the Custom feedback form in 1 day. 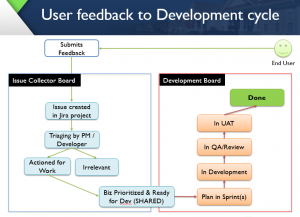 Now we have 2 portals, in which the end-user feedback form is Live, and appropriate workflow is created in the project management tool Jira to assign, track, and work on the end-user feedback.